This parish possesses no advantages. Upon the hill the soil in many places is mossy and fit for nothing. - p. 3, from the short story "No Advantage"
What a queer self-important little thing she is. 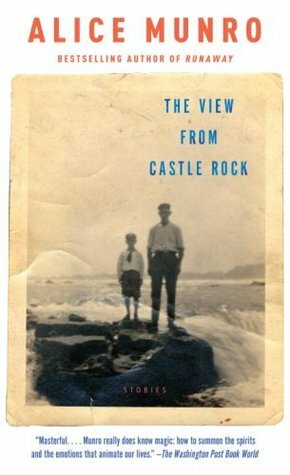 - p. 56, from the short story "The View from Castle Rock"
About The View from Castle Rock: Stories by Alice Munro*: In stories that are more personal than any that she’s written before, Alice Munro pieces her family’s history into gloriously imagined fiction. A young boy is taken to Edinburgh’s Castle Rock, where his father assures him that on a clear day he can see America, and he catches a glimpse of his father’s dream. In stories that follow, as the dream becomes a reality, two sisters-in-law experience very different kinds of passion on the long voyage to the New World; a baby is lost and magically reappears on a journey from an Illinois homestead to the Canadian border. Other stories take place in more familiar Munro territory, the towns and countryside around Lake Huron, where the past shows through the present like the traces of a glacier on the landscape and strong emotions stir just beneath the surface of ordinary comings and goings. First love flowers under the apple tree, while a stronger emotion presents itself in the barn. A girl hired as summer help, and uneasy about her “place” in the fancy resort world she’s come to, is transformed by her employer’s perceptive parting gift. A father whose early expectations of success at fox farming have been dashed finds strange comfort in a routine night job at an iron foundry. A clever girl escapes to college and marriage. I read this in 2009 but never got around to reviewing it. Now I have it in my re-read pile because the2016 Read the Nobels Challenge brought to light that Alice Munro is now a Nobel Prize Laureate. Munro is well-known for her short stories and this collection is well worth it! Have you read any of Munro's work?